It’s 7am on a bitterly cold grey Saturday Morning. The wind is blowing a hooley and the rain is coming down in buckets. What I want to do is roll back over and pull the duvet over my head – instead I crawl downstairs, make a cup of tea (Assam – something strong and punchy) and head back upstairs to get dressed before driving to Manchester to tour a hotel. Yes you read that right – 7am, Armageddon outside and I’m driving to Manchester to tour a hotel! The Principal Hotel has a commanding presence. It is a large red brick building standing on the corner of Oxford Street and Whitworth Street. 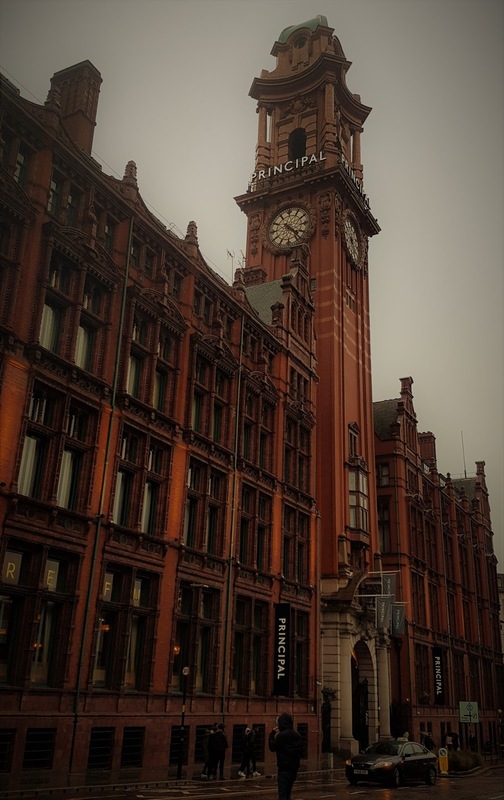 When you walk out of Oxford Road railway station, The Palace Theatre stands on one corner and The Principal Hotel with its imposing clock tower stands on the other. Now I know it’s strange for me to travel somewhere and ignore the theatre, but here’s the thing, I met friends and had lunch at the hotel in December. 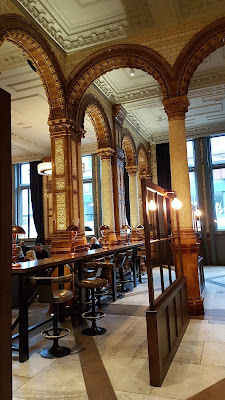 I was blown away by the interior of the hotel and the original circa 1900 glazed tiles that adorned the walls and Romanesque pillars. My friend then casually dropped into the conversation that she’d worked with people who had done a tour of the hotel. A quick search of the internet threw up Jonathan Schofield tours. We were soon booked in for 10am Saturday 3rd February, for a history lesson and hopefully some nice photographs of the building. The first thing to remember whilst taking the tour is that the building was not originally a hotel. 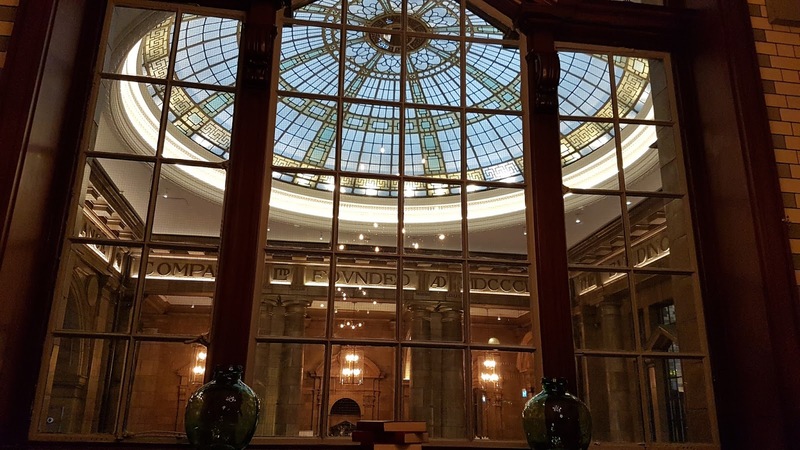 The size and grandiose nature of the building works perfectly as a bespoke hotel, but from 1895 to 1987, this magnificent Grade II listed building was the home of The Refuge Assurance Company Ltd. It was an English company specialising in life insurance and pensions; as the company grew, so did the building. The first phase of the building, the part directly on the corner of Oxford Street and Whitworth Street, was built by the Victorian architect Alfred Waterhouse during 1891 -1895. 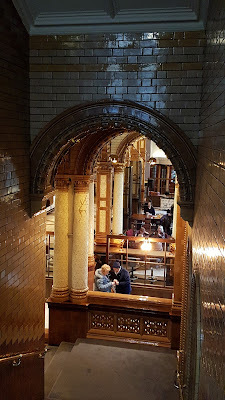 Waterhouse was a well-established name, having built the Natural History Museum in London, Manchester Town Hall and Owens College (now Manchester University). There were 900 clerks working in the building, but as the company grew, they needed to expand the building. They purchased the land adjacent to the building in 1905, however, Alfred Waterhouse died in the same year and so the company turned to his son Paul to complete the works. Paul Waterhouse had worked alongside his father and so he turned his hand to doubling the Oxford Street frontage as far as the River Dart, matching his father’s existing style, scale and materials. 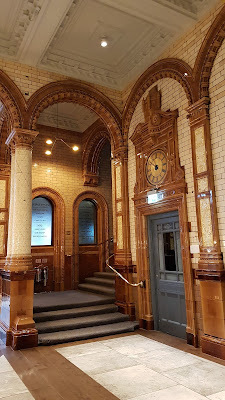 He added a 220ft clock tower in the centre of the building and this became the new front entrance. 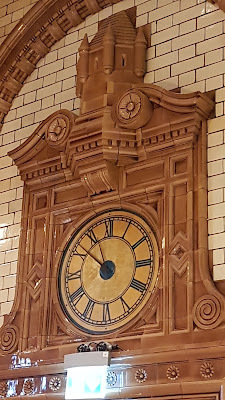 On each of the quarters of the clock face there is a stylised Manchester Bee. Throughout the building, both inside and out, there are countless symbols and imagery, reminders to the workforce what they were there for. As you walk through the doors to enter the main reception of the Principal Hotel you pass by the statues of Thrift and Industry. You suddenly get an immediate sense of just how formidable the building is and what it must have been like to work there. Staring up at the large ornate dome that dominates the inside of the building you feel like a tiny ant in comparison. It was here, in reception that I met with another 30 or 40 like-minded people. Who would think a tour of a hotel could be so popular?! We were blessed to have Jonathan Schofield take us on the tour (his website pre-warns that he doesn’t always take the tours). 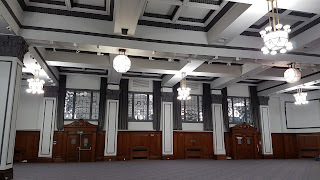 He is a charismatic fellow with a wealth of information about Manchester, its buildings, its history, its industry, all brought to life with anecdotes and interactions with those on the tour. The tour starts outside, standing on windswept, rainy corner, looking at the buildings of Alfred and Paul Waterhouse. Even on this dismal day there is grandness to the building, although it would be enhanced by a bit of blue sky and some sun bouncing off those small, red bricks! Back inside to the reception area. Originally it was open to the elements, you can see the original gutters inside the entrance doors, and if you look carefully you can see it was designed as a porte-cochere, or coach gate; a structure through which a horse and carriage would pass (later a motor car) arriving through one arch and departing through the other. This allowed occupants protection from the elements. This all stopped once the dome was built. Inside the walls are covered with lighter tiles to allow light to diffuse through the building. Originally in the centre was a cenotaph, but this was the only original feature that Refuge Assurance took with them when they left the building for their new office in Wilmslow in 1987. In its place a large statue of a horse commands attention. It was sculpted by the great great granddaughter of Charles Dickens (Sophie Dickens) and so there are some quotes from Dickens surrounding the horse which is made of iron and is about 1.5 times the size of a real horse. The horse symbolises strength and loyalty, nice virtues for the hotel which commissioned it to have. A trip down into the vaults takes you back in time to why this building was built. There are many vault rooms on the lower level of the building, each filled with a number of lockable, heavy doored cabinets for storing paper policies (not cash.) Everything back in the day was done in triplicate (which took me back to my first days of working at NatWest. I worked in the investments arm, not a banking branch, and whilst I worked in the days of the computer, my colleagues all remembered the days of the white top copy, the green file copy, and the blue reminder/diary copy. To this day, even though I no longer work for the same company, any letters I diarise for a response at work, I still call my “blues”.) 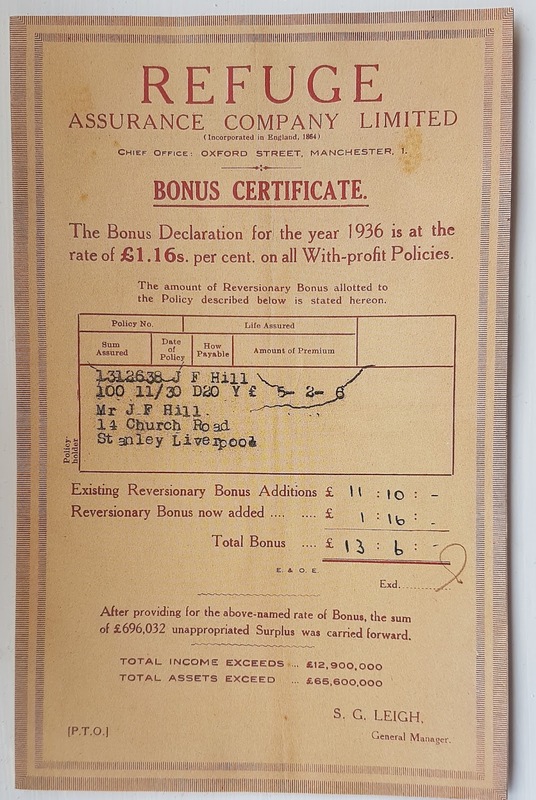 The top policies – the most expensive ones – were held under lock and key in the vaults; this included the policies of the Churchill family who were clients of the Refuge Assurance Company Ltd.
During WWII the vaults had a secondary purpose. The Refuge constructed two reinforced air raid shelters in the basement; one for the general public, one for staff. The building never received a direct hit during the war; however it did suffer small amounts of damage from incendiary bombs. Roof lads were employed to “sweep” any bombs that landed on the building onto the road beneath, and due to the close proximity of St Mary’s hospital across the road, The Refuge housed many patients when the air raid sirens wailed. As you walk out of the vaults past the gate and a huge safe door and a further cage gate, you can see one of the reinforced walls with a blast door which was inserted during the war. The Refuge is home to what is now the largest hotel ballroom in the North West. In the 1930’s, the directors of the company were concerned about the theatres that were popping up and the drunken debauchery they would bring with them. A ballroom was built with its own fully functioning stage with full drops and wings. There were music hall societies, a Gilbert and Sullivan society, a Shakespeare society and most importantly, no alcohol! About four inches below the carpeted floor lies hidden a fully sprung dance floor, like the one at the Tower Ballroom in Blackpool. Modern functions mean tables and chairs dragged across the floor would destroy it, so it lies hidden, secreted away alongside the old games/pool room of which only part of the entrance doors can now be seen on either side of the stage. In the days of the grand old houses, servants and their employers would have their own staircases. 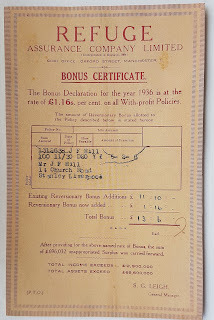 The Refuge Assurance Company Ltd was no different. 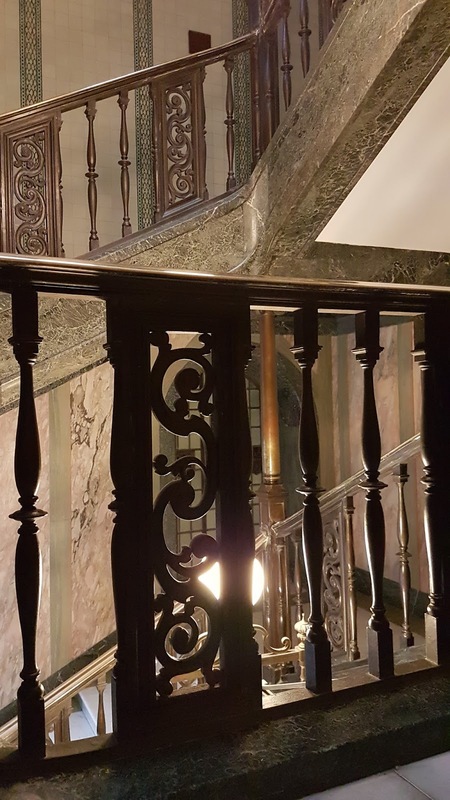 Whilst designing the second phase of the building, Paul Waterhouse also designed the Directors Staircase. It is a strange and highly elaborate affair of bronze and different marbles, including the most expensive Carrara marble from Tuscany. 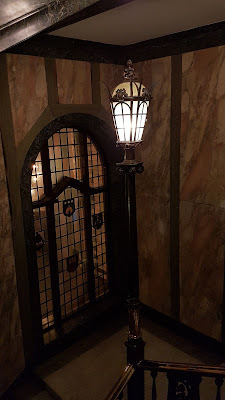 At the bottom of the stairs are two “gothic” lamp posts which wouldn’t be out of place on a vampire movie; as you climb the steps, stained glass coats of arms of the various places Refuge Assurance had ties with dominate, the largest being the Manchester coat of arms, complete with sailing ship for a global outlook, and a globe with seven bees atop. Seven bees for the seven seas on which a trade ship would sail! 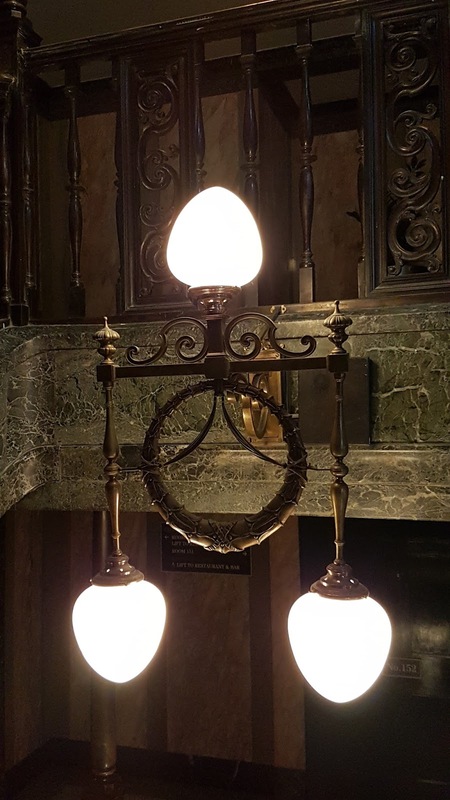 The bees also feature behind the brass lamp fittings that illuminate the way to the top. 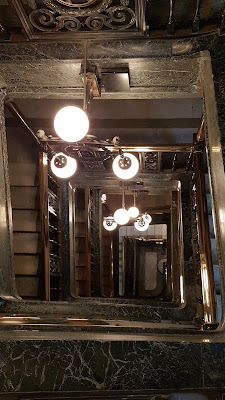 On your way up, if you feel the waft of a draft pass by, it could be that of one of the ghosts of the buildings has passed you. There is a memorial in Wilmslow to the 570 Refuge Assurance men who served in WWI. 285 served and returned, 285 died and are remembered on that memorial. In WWII many more lives were lost; whilst working at The Refuge, one fiancée learnt that her future husband had died in the trenches. Distraught at the news, she ran to the top of the Directors Staircase and threw herself off the top. The stairs take you to the Directors suite of rooms. You would only find yourself in these rooms if you were a Director, a guest, or about to be fired. The rooms were used for boardroom meetings or elaborate dinners and there were liveried staff who cooked for and waited on the Directors. Around the walls yet more imagery can be seen, verses in Latin, castles (every man’s home is his castle) sit atop the heads of carved figures and scallop shells, the symbol of wellbeing, are dotted about. If you look carefully at the swags that hang at cornice level, they are not elaborate plasterwork, but painted fabric which requires careful washing to keep clean and bright. As you head down through the arches into the old banking room, which is now the bar, you get a sense of the hive of industry. That great space would have been full of men sitting at lecterns taking details for assurance policies. This is part of Alfred Waterhouse’s original 1893 building. The internal loggias, reminiscent of large Roman arched buildings take the centre stage in terracotta and faience. (Ceramics which can be glazed or unglazed, but in the casting processes are so dense that the soot and smoke of Manchester’s industry cannot penetrate the tile. This process makes the tile almost self-cleaning with just the aid of water/rain.) The flower on the columns is a Trillium, symbolic of Christianity. The three petals on the flower represent the Holy Trinity. Each triangular tile is a complex mathematical equation as it circles the pillar which taper towards the top. There are numerous messages in the tiles written in Roman numerals. Doors with clocks have yet more castles housed above them in the colour of a Werther’s Original sweet! In the 1960’s The Refuge got their first mainframe computer. It was housed in the area that is now the dining room and it became a thing of wonder. People would visit the building just to see the computer, thinking that with this advancement in technology, it would put an end to the paper systems and form filling. Move forward to 2018 and the building is still a destination point for the visitor. Unusually for a hotel, it’s still a destination location with many people visiting for a few hours to take advantage of the dining area, or to meet friends and sit in the large airy bar…or for some, it’s a chance to visit a unique building with a history to tell! And good job writing that up. 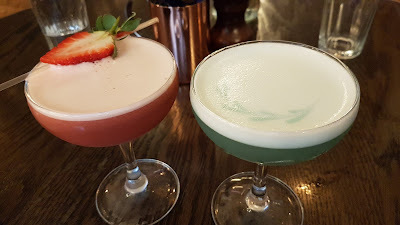 I haven't managed to get back into blogging in the new year so far. Glad you enjoyed it. After such a long break, getting back to the keyboard has been hard work!